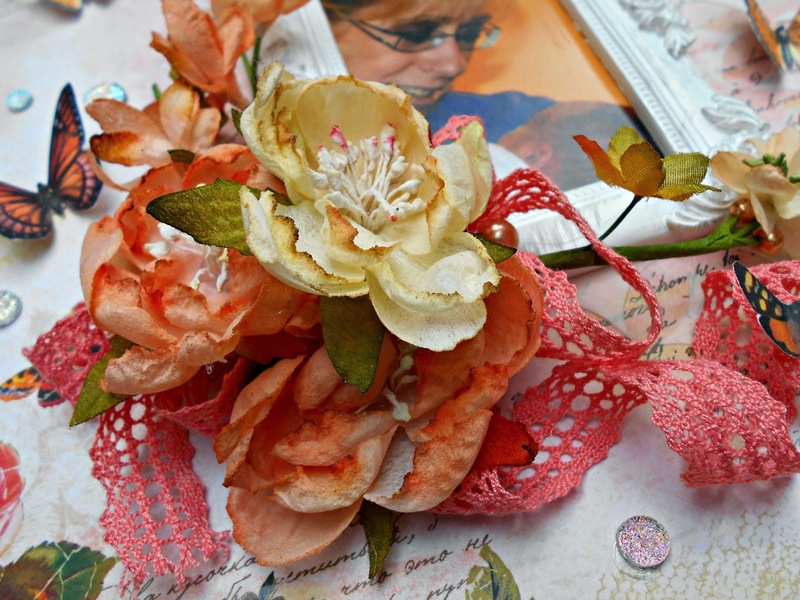 lifetime of pages: Swirlydoos' June Kit Reveal and Blog Hop! 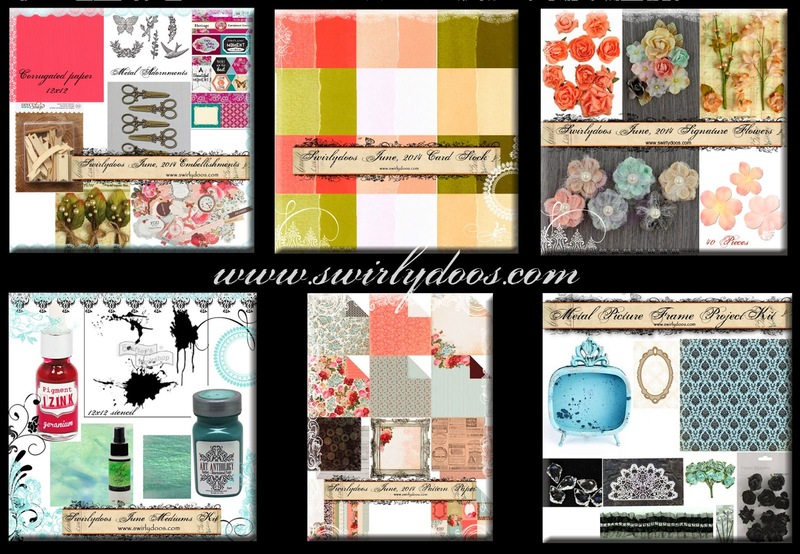 Swirlydoos' June Kit Reveal and Blog Hop! June Scrapbook Kit Reveal & Blog Hop! If you came here from the Swirlydoo's blog, then you are on the right track. We have some amazing projects for you to see today !! Make sure to leave a comment on all of the blogs for a chance to win!!! Make sure you have LIKED & FOLLOWED Swirlydoos on Facebook!!! 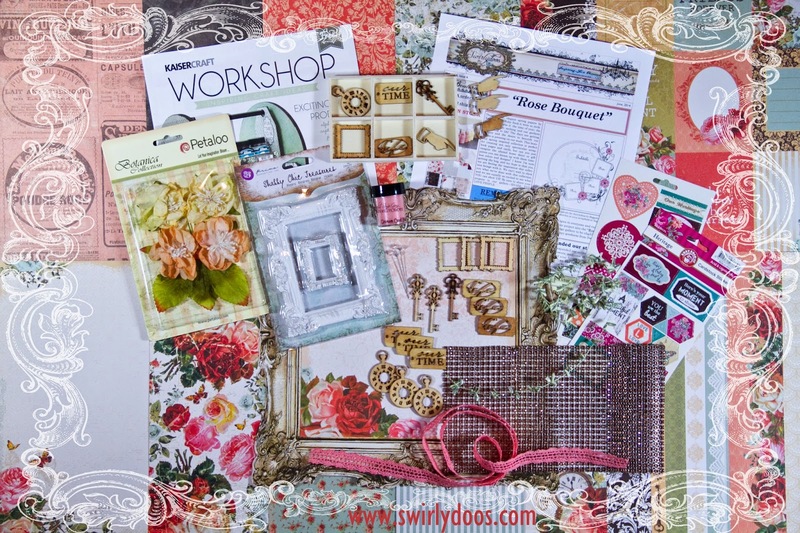 And check out these coordinating add ons that perfectly compliment our June scrapbook kit! Are you a subscriber? If so, your kit is on it's way! If not, check out the Swirlydoos store to see if there are any June kits or add ons in the store! Some of you may recognize my scrappy friend,Laura Gilhuly and her gorgeous family. Be careful what you share on FB because you never know who may scrap it! I used this month's sketch by rotating it on it's side. I love how easily the flowers mix and match and the cool vine that Krissy found for us. The butterflies are courtesy of Lisa Gregory. I chose to leave the Prima wooden pieces natural with just a hint of grey chalk ink to match the natural feel to the page. Just had to add one more little butterfly, some splats of Lindy's mist and moss to finish it off! I started by adding peach,white and gold gelatos to the background,then stamped over that with Something Tattered's French Script and French Month:April stamps. I lightly spread texture paste to soften it up and anchor the picture. My cluster came together easily using the kit and Flower Add-ons. 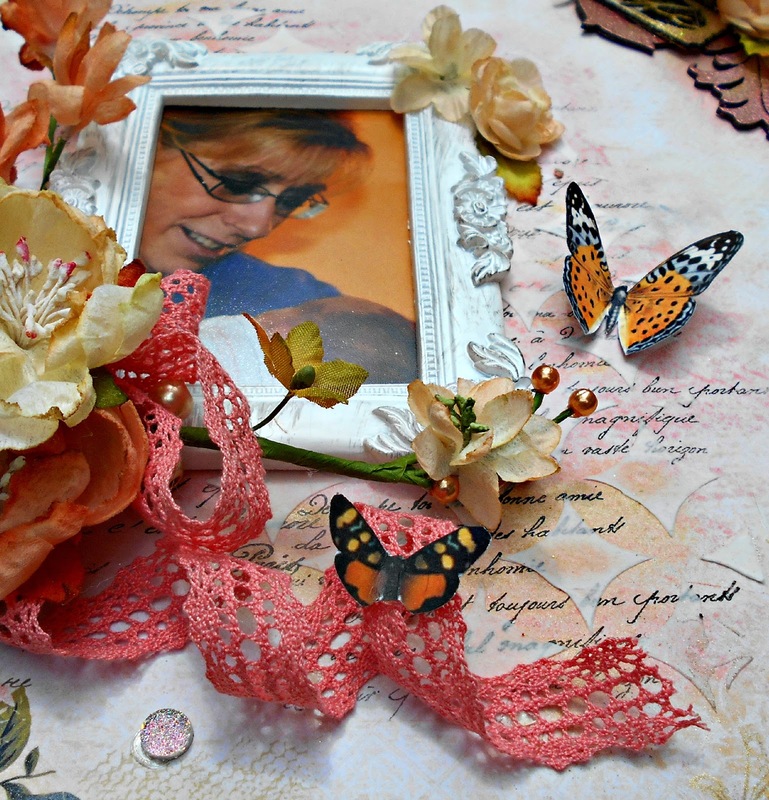 I double tied and then curled and glued the pretty coral crocheted ribbon Krissy found for us. Using the embossing powder from the kit,I lightly treated the Leaky Shed Studio chippie. 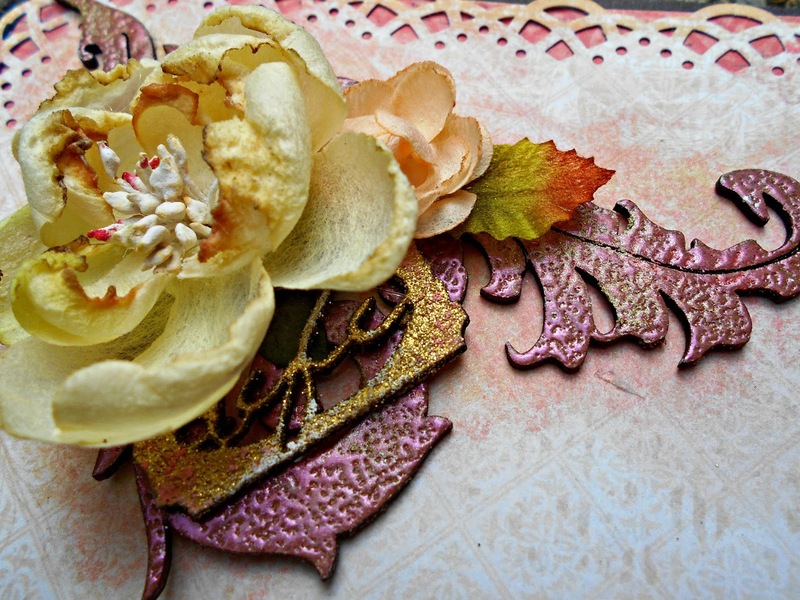 I used gold embossing powder and pink gelato on the prima wooden tag. Lots of depth to this one! My last project for today is a fun page,inspired by my daughter,Naomi,hamming it up as a Diva during a photo shoot. I fussy cut the roses and layered them,backing them up with cardboard. I cut out the center of the frame and embellished it with bling from this kit and past kits,along with liquid pearls. 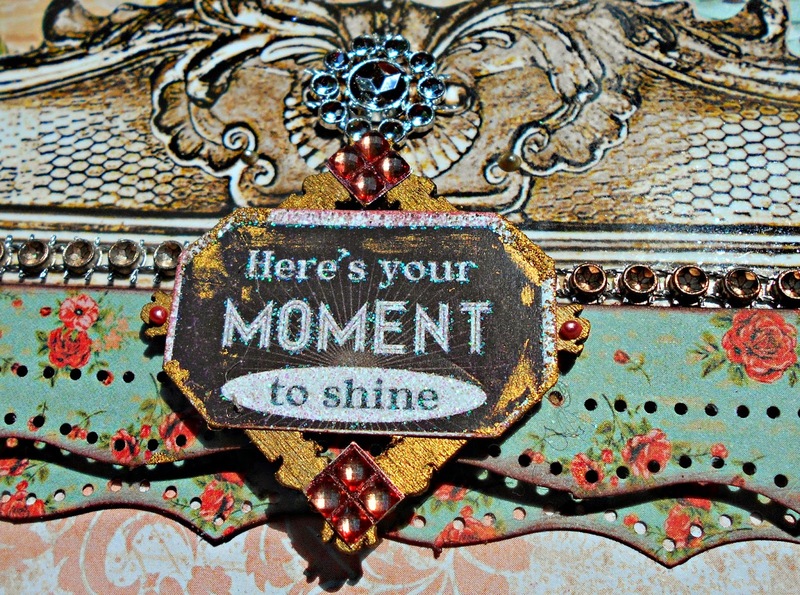 I used Gold Rub n' Buff on the Prima wooden tokens and directed them at the "star" of my page. 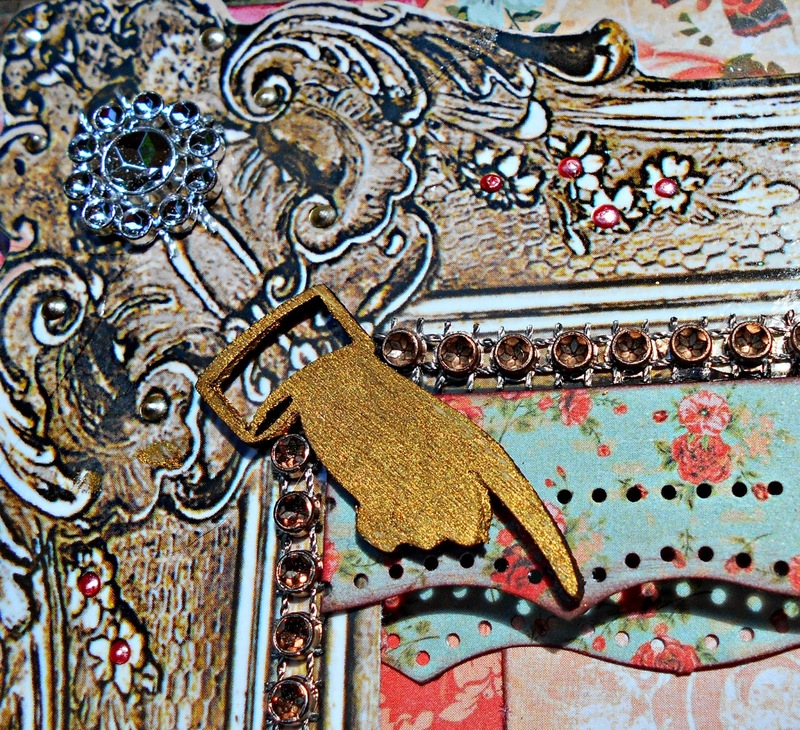 My title came from the package of stickers from Ruby Rock-it attached to a gilded Prima frame and bling. The party continues over at Maja's blog. Have fun! I love what you've done with this kit, Tracey! Fabulous! Beautiful layouts! I love how you used this kit!! Love the layouts. The first reminds me of a dream-catcher. So pretty with the circle and all of the flowers. Thanks for sharing such pretty pages. What gorgeous pages filled with so much pretty detail! Love the flowers and butterflies! Looks like a fabulous kit! OMG you have a new fan!! I absolutely love all your creations!!! oh my godness, how beatuiful work, you are an amazing artist! Oh my Tracey these layouts are exquisite! I love each one of them. The last is jaw droppingly gorgeous! You are so talented. I love the layouts and I love the way you used the trim. Tracy I love your work! These all three gorgous! Amazing projects Tracey! Love them all! Thanks for the inspiration! this kit is so beautiful...so are your layouts! Thanks for sharing! I love the gorgeous pages you made with this kit!!! Tracey: Love all of your projects, but that first one is so amazing. Gorgeous! Love, love, love your take on the sketch. The colors are yummy! Wow Tracy, these LOs are so glamorous & elegant! Tracy, your pages are stunning. Thanks for all the good ideas. Not hopping … just came straight here to get inspired! And wow! Can't pick a fave but dearly love that one of Laura's family .. it's amazing! Hugs! absolutely stunning, 3 layouts, Where do you find the time for these amazing creations. Beautiful. 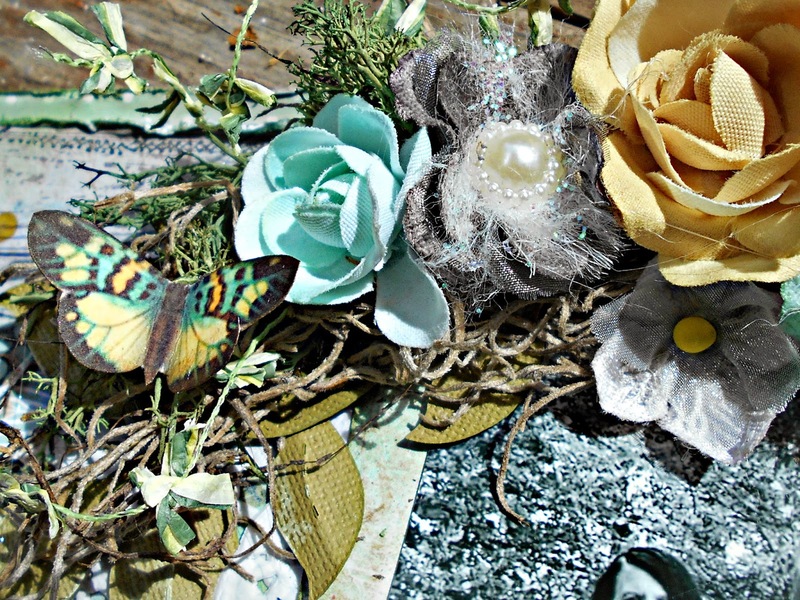 truly stunning layouts, love especially the details and lots of pretty embellishment on them! You have done an amazing job with this kit. 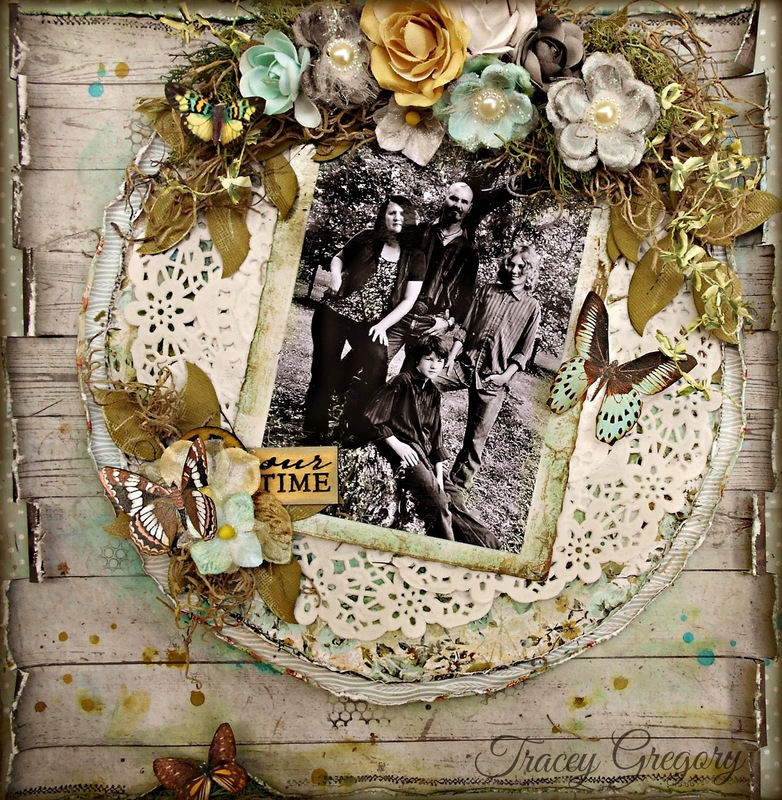 Your pages are so Beautiful Tracey!!! 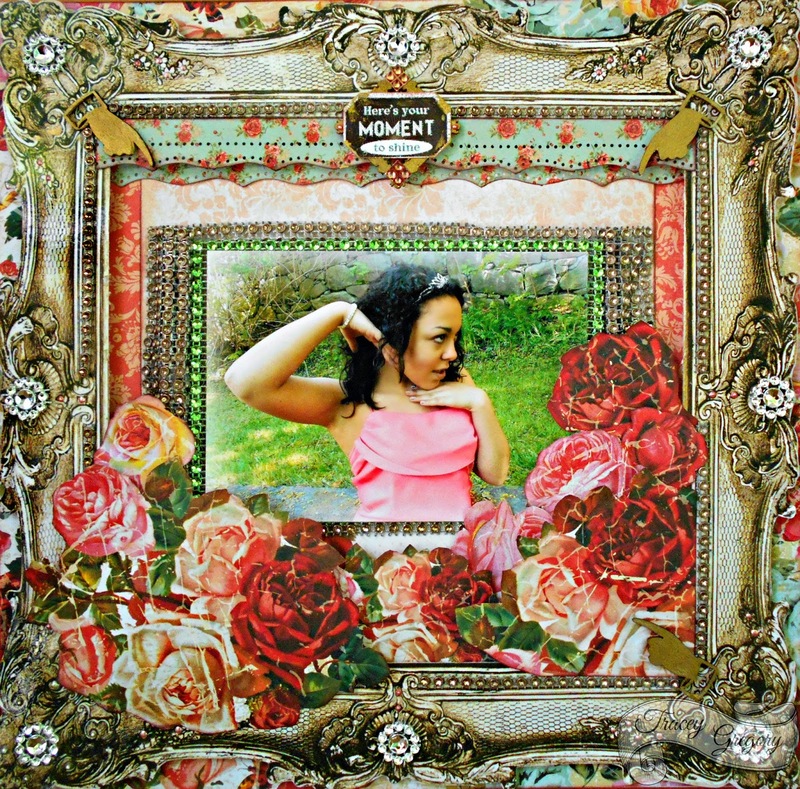 You've created such beauty with this kit Tracey! Love each and every one! All 3 of your projects are gorgeous. 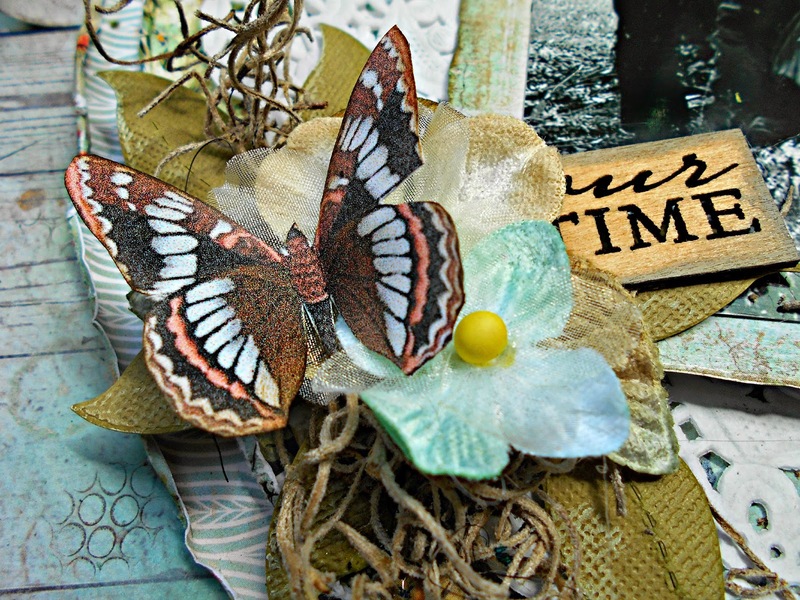 Great use of the papers and the embellishments. Love the colors in this kit.